Austrian painter. He came from a family of craftsmen and studied (1815-24) at the Akademie der bildenden Knste, Vienna, where one of his teachers was the conservative history painter Hubert Maurer (1738-1818). 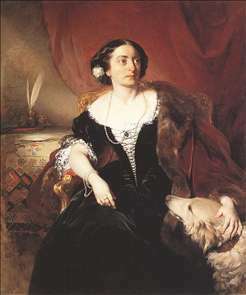 From 1824 to 1826 he attended the Academy in Prague, where he was taught by Josef Bergler. 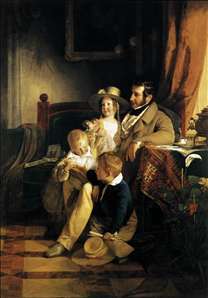 In 1827 and 1828 Amerling stayed in London, and he met the portrait painter Sir Thomas Lawrence, whose work was to be a strong influence on Amerlings painting during the next two decades. 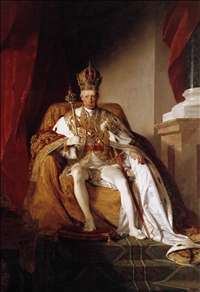 Amerling also travelled to Paris and Rome but was recalled to Vienna on an official commission to paint a life-size portrait of the emperor Francis I of Austria (Vienna, Kunsthistorisches Museum). With this work, Amerling became the most sought-after portrait painter in Vienna, a position he was to retain for about 15 years. In addition, he was also a major painter of historic and genre pictures, and landscapes. He worked mostly for the arictocracy. He was the master of the Hungarian painter Jzsef Borsos. See more details about "Rudolf von Arthaber with his Children"
See more details about "Emperor Franz I of Austria in his Coronation Robes"
See more details about "Countess Nákó"
See more details about "Portrait of Count István Széchenyi"